In Canada (see sect. 10.1 of this exhibit), the UK, and elsewhere, governments passed legislation to outlaw or restrict the sale of American crime and horror comics, particularly, to minors. In the United States, however, the First Ammendment to the Constitution safeguarded rights to freedom of expression, which made passing laws against the production and distribution of comics more difficult to pass. Grassroots anti-comics campaigns of the sort described in section 8 of this exhibit did translate into legal and legislative efforts to ban objectionable comics in the US, regardless. 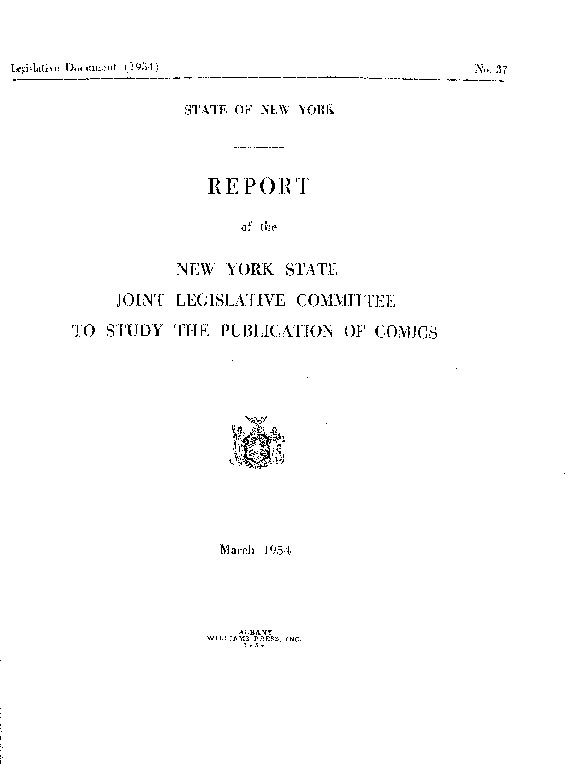 New York State saw perhaps the most concerted efforts to pass laws preventing children's access to morally corrupting comics. 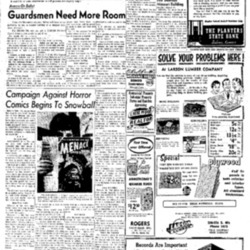 In 1949, a New York State Committee to Study the Publication of Comics was struck in response to the increasing negative press and public sentiment over the contents of what most considered a children's medium. 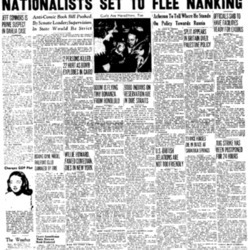 THe New York State Joint Legislative Committee, chaired by Assemblyman James A. Fitzpatrick and Senator J. Stanley Bauer, issued its report some 5 years after the committe was struck. In it, they cited Frederic Wertham's claims, naturally, supported by FBI Director J. Edgar Hoover's authority as the nation's chief law enforcer. Based on FBI research into the dramatic increase in juvenile delinquency in the post-WWII era, Hoover claimed that comics "may serve as a spring board for the unstable child to commit criminal acts" (12). The committee saw as its mandate the pursuit of "legislation to curb the evils" caused by comics reading, which "adversely affect the physical, social and religious welfare of children and of emotionally unstable adults" (34). The appendices to the report contain recommendations for a number of Acts to ammend laws governing the production and sale of obscene materials (primarily comics, but also pocket books and film) to minors. None were passed into law.